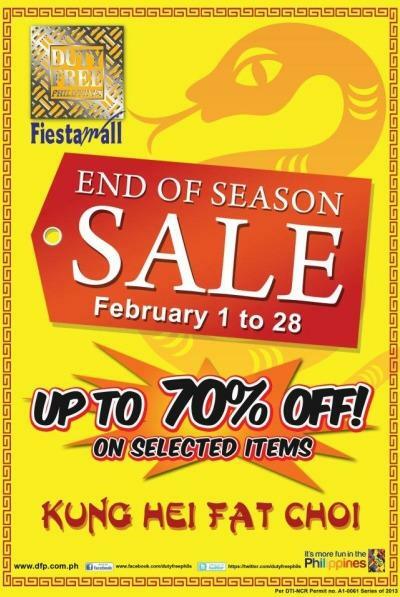 Duty Free End of Season Sale is from February 1 to 28, 2013. 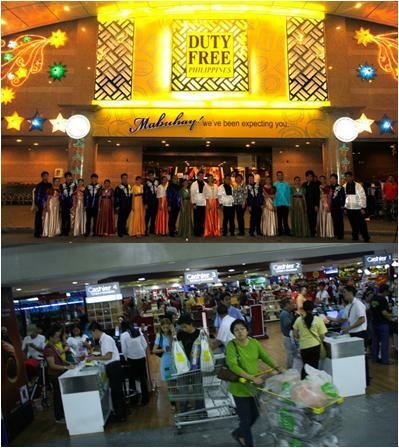 Happening only at the Duty Free Fiestamall. Who can shop at Duty Free? Arriving passengers (Regular Filipino Travelers / Foreign Tourists / Balikbayan / OFWs), immediately upon arrival from a foreign country, at an international airport or seaport. Departing passengers with confirmed bookings destined to foreign countries immediately before boarding their flights or vessel at an international airport or seaport of entry / exit.. Diplomatic personnel/personnel of other foreign governments and offices of international organization, institutions, associations and agencies entitled to tax and/or duty exemption as endorsed by the Department of Foreign Affairs may purchase tax and duty free merchandise through their respective embassies, legation, institutions, organization, association, consular offices or agencies provided that the purchase/sale shall be done through a Purchase Authorization/Order. Arriving passengers (regular travelers/foreign tourists) can shop within 48 hours upon arrival from a foreign country. Balikbayans/Overseas Filipino Workers' purchases must be made within fifteen (15) calendar days from the date of arrival.